On this Thanksgiving morning, I discovered an Ayn Rand quote that really got me thinking. Thanksgiving is a typically American holiday. 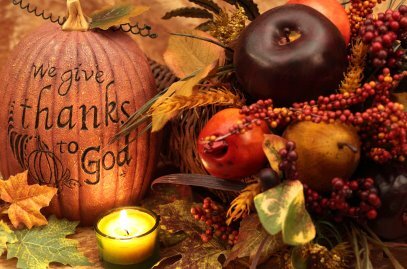 In spite of its religious form (giving thanks to God for a good harvest), its essential, secular meaning is a celebration of successful production. It is a producers’ holiday. The lavish meal is a symbol of the fact that abundant consumption is the result and reward of production. Ayn Rand, despite her atheism, has impressed me immensely on morality — especially in regards to individual responsibility. (read: objectivism) However, I believe that her quote shows how atheism can only take you so far. Thanksgiving is not the celebration of success earned through hard work. (If that is the case, what are we giving thanks for on Thanksgiving? Ourselves?) And it’s because hard work does not guarantee success. Countless good people sacrifice hours of planning, work, and hurt to achieve success; and yet because of an unfair circumstance, or someone else’s ill-will, or simply a bad break, they do not achieve success. (Think about the Pilgrims who worked hard and still did not survive their first winter.) Their heartbreak is tragic, really. Rather, Thanksgiving is the reminder that — while our hard work can set us up for success and comfort — our blessings and gifts, ultimately, come from God. It’s a realization that we are not automatically entitled to success because of our hard work. And it’s also the realization that we don’t have to have small gifts oft taken for granted: family, friends, food, a home. We didn’t have to be born with these gifts. And even if we were, they could easily be lost. Thanksgiving reminds us that we don’t have to have anything. And yet, because of God’s grace, we do. That’s why it’s so appropriate to dedicate a day of giving thanks to Him, who gives us everything. This entry was posted on Thursday, November 24th, 2011 at 8:48 am and is filed under 3. Editorials. You can follow any responses to this entry through the RSS 2.0 feed. You can leave a response, or trackback from your own site.